Loaded Halloween Crispy Marshmallow Treats. 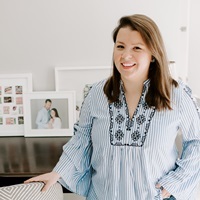 Our favorite candy and sweets filled holiday is right around the corner and I’m getting prepared with some Halloween recipe ideas. 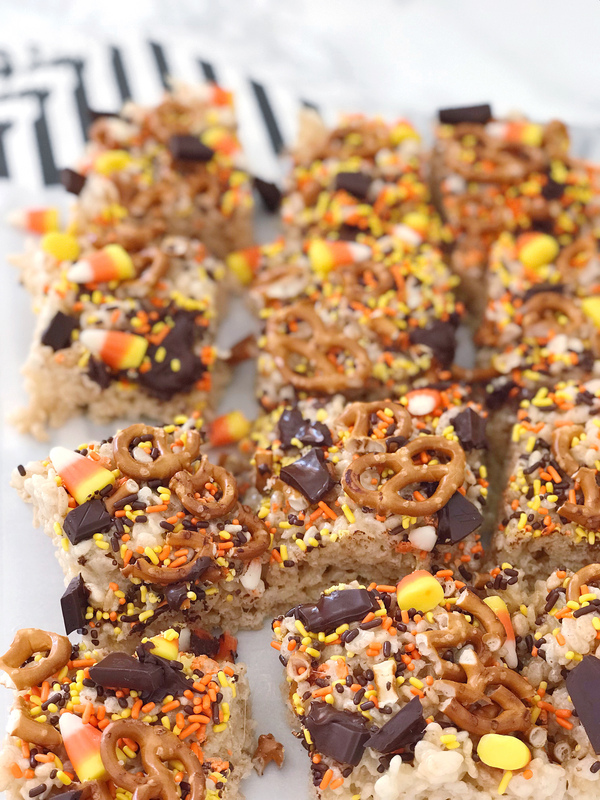 My friends at Peapod challenged me to come up with a Halloween treat that was both gluten-free and nut-free, and still delicious for all to enjoy. 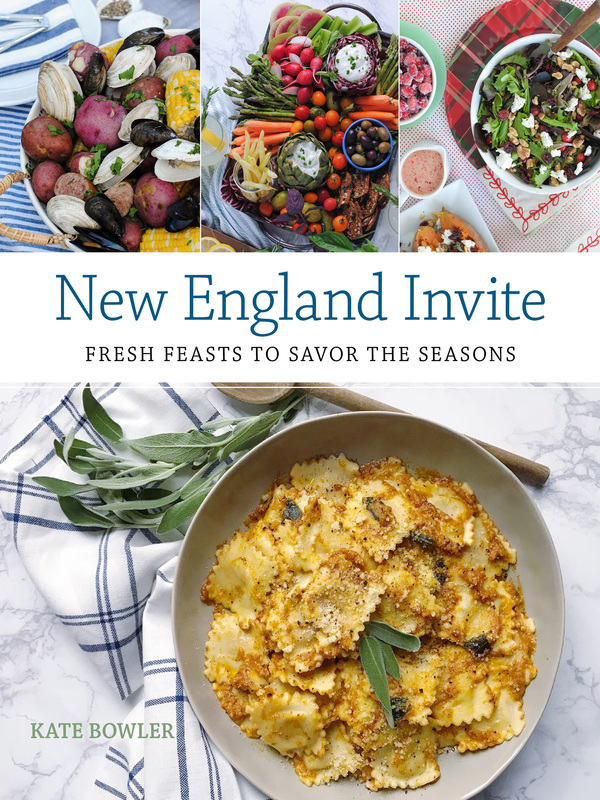 I love challenges like this because I feel like I’m on one of those competitive cooking shows, and nothing gets my creative juices flowing like friendly-competition. We actually have quite a few relatives who are gluten-free for health reasons, so I happened to know that my classic marshmallow crispy treat recipe starts with all gluten-free ingredients: butter, marshmallows, and crispy rice cereal. I thought it would be fun to jazz them up with a ton of Halloween colors and candy layered on top for a really festive look and some extra indulgent flavors. 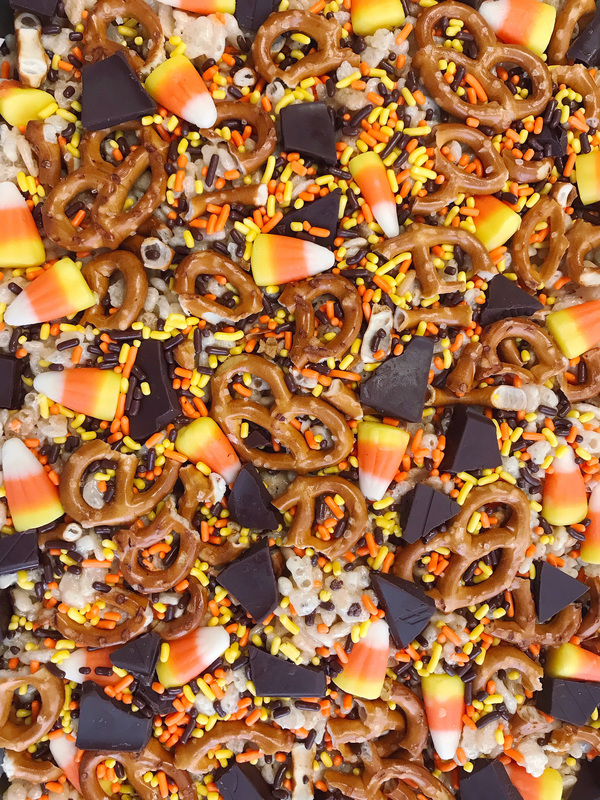 I crushed up gluten-free pretzels, dark chocolate bars with sea salt, Halloween-themed sprinkles, and candy corn! Check your labels on both the sprinkles and candy corn – many brands are gluten-free, but some note if they’re not made in a nut-free or gluten-free facility. 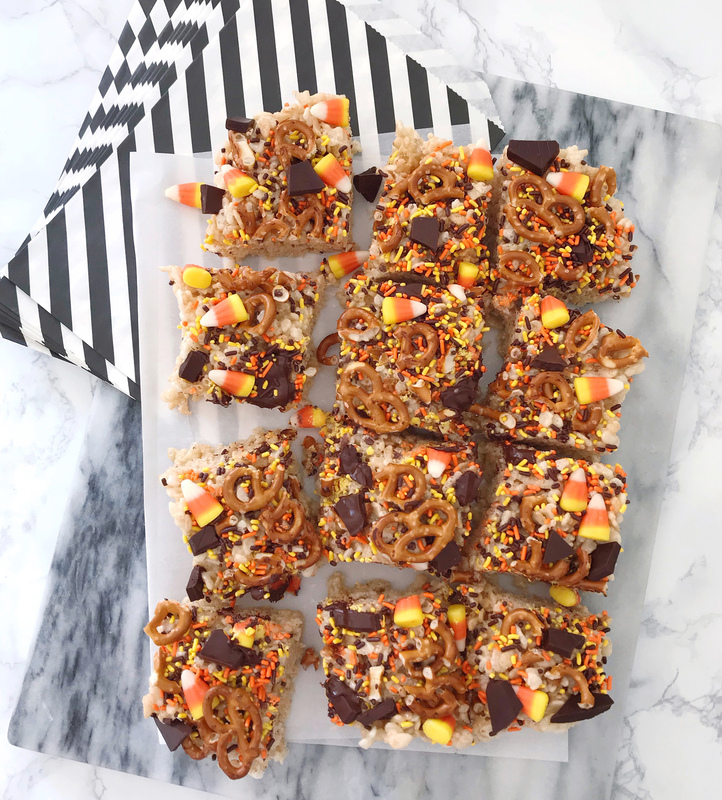 These ooey-gooey marshmallow-y treats look so over the top presented on a plate with the candy and crunchy pretzels spilling onto the sides – they’re sure to impress everyone at your Halloween gathering. Line a baking dish with parchment paper and set aside. In a large pot, melt butter. Once butter is melted, stir in mini-marshmallows. Stir the butter and marshmallow mixture continuously until incorporated and marshmallows are fully melted. Remove from the stove and quickly stir in cereal, until all pieces are coated with marshmallow mixture. Transfer mixture to the lined baking dish and using an additional piece of parchment paper, lightly press the crispy treats into the dish. 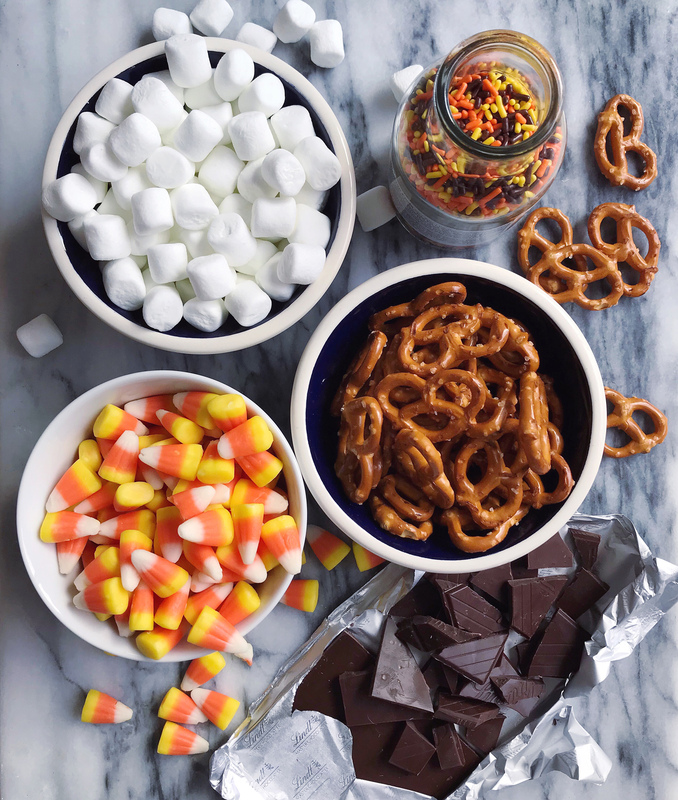 Let the treats cool for 3 minutes and then add on sprinkles, candy corn, and pieces of the dark chocolate bar and crushed pretzels. Press the toppings into the crispy treat surface to get them to stick on top, and let the tray rest for 1 hour before cutting into a dozen square pieces. A Cozy Fall Reading Nook. Brown Butter Pumpkin Ravioli. One Response to "Loaded Halloween Crispy Marshmallow Treats."